Melissa Good checked out one of our Facebook photos and spotted her former second-grade teacher at St. Bernard in Mt. Lebanon. 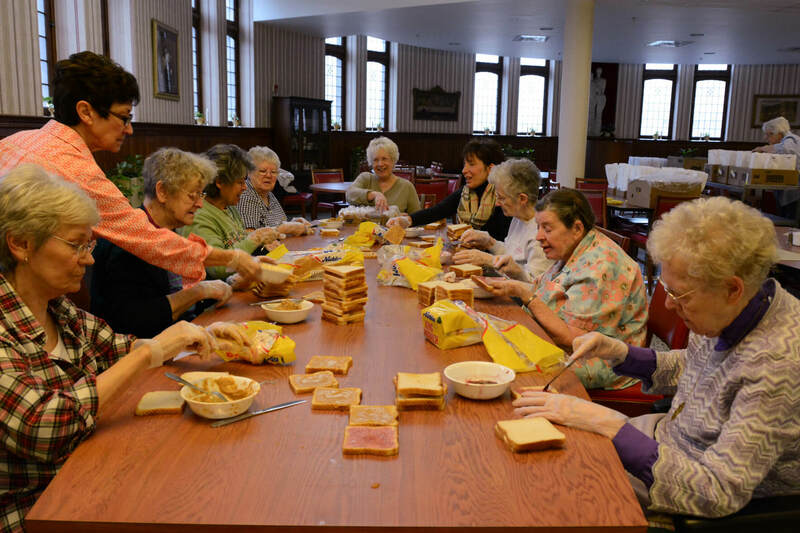 In the photo, Sister Alberta Grimme was part of an assembly line of retired Sisters who were making peanut butter and jelly sandwiches for the local Salvation Army. 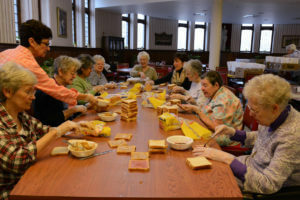 The occasional activity is one way that our retired sisters continue to serve the poor. Instead of “giving up” something for Lent, Melissa and husband, Mark, decided to reach out to local groups that provide food, clothing, and shelter to those who are economically disadvantaged. Melissa was inspired by our sisters’ PB&J Project and outreach to the Salvation Army. Because Melissa and Mark wanted to help nearby neighbors, they thought the sisters’ project was “a perfect fit” for them. Through the Goods’ donation of $250, our sisters were able to pack a few “extras” with the 150 sandwiches that are served to homeless individuals. Thanks to their generosity, homeless individuals not only received their standard luncheon fare of peanut butter and jelly sandwiches, but they also were treated to a bottle of water, a can of soda, chips, cookies and a banana. “We hope to continue with random donations throughout the year, not just limiting them to the Lenten season,” Melissa said. Melissa reconnected with Sister Alberta two years ago at a St. Bernard reunion and kept in touch through notes, letters and occasional visits. During a recent visit, Melissa brought a copy of her second-grade class photo and the pair reminisced about St. Bernard’s. With wonderful memories of her formative years, Melissa recalls special traditions like making the Stations of the Cross during Lent and the annual May Crowning. She also remembers learning cursive in Sister Alberta’s second-grade classroom, where papers with excellent penmanship adorned the walls at the end of each week. As a child, Melissa only visited the Motherhouse once for the annual Harvest Festival but has enjoyed recent visits with Sister Alberta and even recognized her eighth-grade teacher, Sister Silveria Mannion, in the dining room. An avid flower gardener and baker, Melissa also creates stained glass pieces and gifted a beautiful, handmade lamp to Sister Alberta during her last visit. She enjoys the challenge of cutting and soldering local, hand-rolled glass into stunning creations for others. 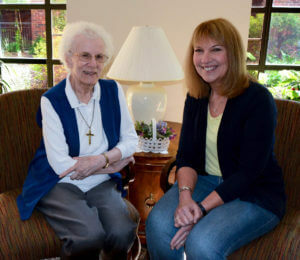 When she’s not cycling the Montour Trail or kayaking local lakes, Melissa brings joy to residents of a nearby retirement home by volunteering at social gatherings like tea parties and birthday celebrations. Melissa and Mark have three “delightful young adult” children, identical twin sons and a daughter, and reside in Upper St. Clair.